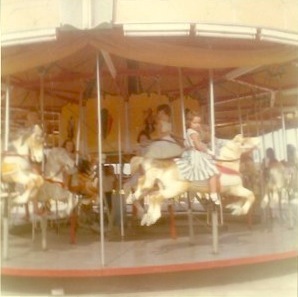 We ride the merry-go-round twice. The ornate pipes from the organ make even the most ordinary songs entrancing. The white horse is beautiful with its flowing mane. I run to the black stallion and feel brave atop such a handsome steed. My short hair streams in the wind, the smell of popcorn and cotton candy fills my lungs, my mouth and eyes watering as we speed up. I want to stay on this ride forever. I have my eye on the palomino but the rest of the group is ready to move on. I throw the empty white cardboard in the trash and hand the gatekeeper my somewhat sticky ticket and choose a car in the corner. I find an animal that looks as meek as I feel. I sniff the air and smell fear. “You bet”, I say, hoping to sound like everyone else.